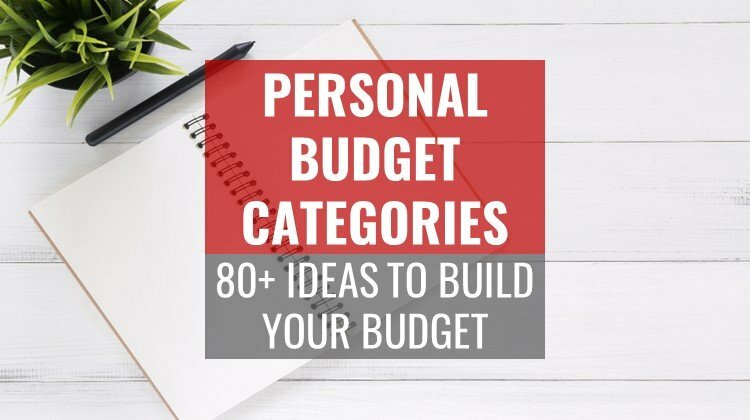 80+ Personal Budget Categories - Get Your Finances Under Control! Are you ready to get your personal budget under control, but are overwhelmed when you think of where to start? When I first started budgeting, one of the hardest things for me to do was come up with personal budget categories that all of my spending fit into. Sure I thought of the main categories of rent, utilities, food, etc. But when it came to all of the small expenses, there were always surprises each month that I had to account for. First things first, you should have a handle on all your various sources of income and how much you expect to bring in each month. If you’re just getting started, I would recommend tracking net income. It’s an easier number, and it also eliminates some other expense categories you have to track because it’s taken directly out of your paycheck. If you want to get more detailed (or if you are a spreadsheet and data nerd like me), you might want to track your total gross income and your payroll deduction expense separately. Either way is perfectly fine, so just get tracking! If you have a commission-based or other variable income, you may have to estimate this number one month at a time for your budget, or try to determine an average. Similarly, if you’re paid every 2 weeks you’ll get 2 “bonus” months where you receive an extra paycheck (because there are 26 pay periods over 12 months). In addition, you might have other sources of income you rely on each month. Make sure to account for everything! The first of the “Big 3” categories (housing, food, and transportation), housing generally accounts for 30% or more of your household budget. According the the latest government statistics, those 3 categories account for 60% or more of the average household budget. I always recommend that if you want to look for really effective ways to cut your budget (instead of cutting out your morning coffee), look at your housing. You can often make some small changes that have a big dollar impact on your budget. Whether you rent or own, housing is an essential item in every budget (unless you are living in your parents’ basement I guess). Here are some of the personal budget categories associated with housing. Transportation is a big category – if you live in a big city maybe this includes bus/subway fare and Uber/Lyft. If you’ve got a family in the suburbs it could be buying and maintaining multiple personal vehicles. Like housing, if you’re looking for places to really cut your budget, transportation could be a big one. According to a AAA study, the average cost to own and operate a new car is almost $9,000 per year (including depreciation – a hidden expense most people don’t consider). Everyone has to eat. But I’ll be honest, this is one of the personal budget categories that quickly gets out of control in our house. We have to periodically evaluate our spending and rein it in. With so many grocery stores and convenient take-out options, it’s easy to overspend. The expense categories you keep track of for your food budget can depend on where you feel like you might be overspending and want to save money. If you get coffee everyday on the way to work, maybe you want a category specifically for that so you can visually see how much you’re spending on your habit. For us, we just track 2 categories – groceries and restaurants/take-out. Utilities are a necessity in modern life. While there are lots of ways to trim your budget when it comes to saving water or electricity, you still need them to live. However, there are some utilities you can do without. We’ve gone without cable for several years now and barely miss it (but to be fair, we’ve replaced it with a few different subscription services that are much cheaper). This is by far our biggest budget category as far as number of line items. It covers a wide range of things for our family from child care to clothing to household supplies. Everything needed to keep the household running smoothly. If one or two of these items are hard for you to keep under control (like every time you go to Target you buy $150 worth of throw pillows and decorative items), I would highly recommend breaking it out separately so you can track it and figure out how to cut your spending. You need some portion of your budget dedicated to having fun! For our family this covers stuff like our Netflix and Spotify subscriptions, movie tickets, and travel expenses. One way we’ve been able to save a bunch of money on the entertainment category is by using credit card rewards to cover our travel expenses. We haven’t had to pay for a plane ticket in almost 3 years now! See how we used points to pay for our trip home to see family in our October Extra Income Report. Depending on how you track your income, this might be a large or small percentage of your budget. If you track your payroll deductions for things like health insurance, dental insurance, and disability insurance it would go here. In addition, any out-of-pocket health care spending like doctor co-pays or prescriptions would be included in this section. While insurance is not a fun topic to talk about, it’s a critical part of planning for the stability of your family’s financial future should something unexpected happen. Whether for you or your kids, education expenses can add up quickly. Our kids are still young so we haven’t hit the big spending years yet. I was also fortunate enough to work for an employer that paid for me to get my master’s degree! There are lots of ways to save money on education, but sometimes it comes down to lifestyle choices (i.e. public vs. private school) that only you can determine the value of. Ideally, this is a category you could just skip over. But seeing as how we live in the real world, debt is often a fact of life. Still, minimizing or eliminating your debt payments as quickly as possible is a goal worth fighting for. While our family has a mortgage (which we budget under housing) and a car payment (which we budget under transportation), we have worked hard to pay off all other debt and keep it that way. But paying off debt doesn’t happen overnight, so while you are working on it, keep tabs on your payments in your budget and allocate as much as you can to paying it down! It’s no secret that I think giving a portion of your money away to worthy causes should be a top priority, even when you don’t have much to give. Charitable giving helps you put money in perspective so that it doesn’t control you. And just like money in the bank grows through compound interest, your giving has a compound effect over time. Even a small amount can go a long way to helping those in need. Last but certainly not least is savings. Consider this a payment to your future self. Most experts recommend saving at least 10-15% of your income for retirement and emergencies. If you want to build wealth faster and get on the path to financial independence, there is no limit to what your savings rate can be – the higher the better! While you want to have some money put away for emergencies, it’s often a better idea to tackle high-interest debt (such as credit card debt) first before allocating more money to savings. One exception would be if your employer offers a 401(k) match. Always contribute enough to get the match – that is a 100% return on your money! After reading a list like this, it can be overwhelming. How do I get started making a budget? Go through the categories again and pick out the ones that apply to you (not all of them will). Feel free to combine some categories together, or add others that you need. Then start by tracking your expenses for a month. See how you’re doing – are you spending more than you make? Do you have extra left over at the end of the month? You need to know where you are to be able to set realistic budget goals. What categories should I include in a budget? Some of these may not apply to you, but most of them probably will. 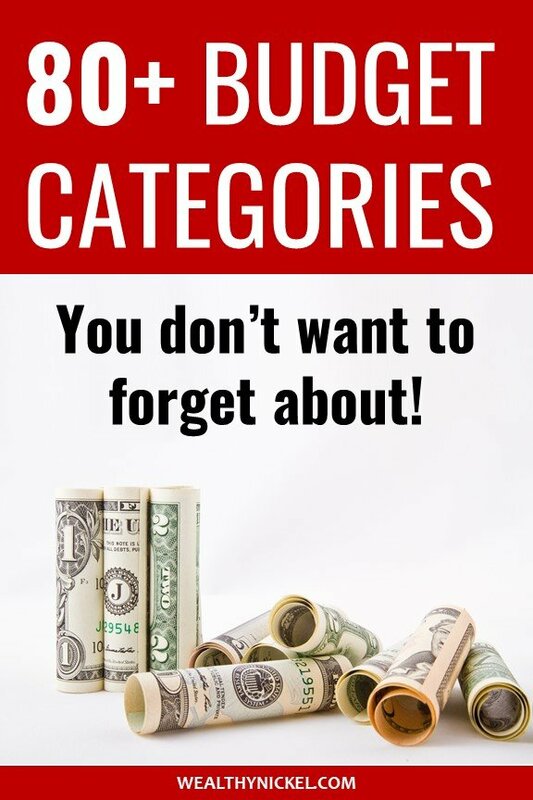 You will want to consider including sub-categories in your budget when you start tracking your expenses and one category seems to absorb a lot of your budget and you still can’t figure out where the money is going. Break it down further to see exactly where you’re spending. The 50/30/20 budget is an extremely simplified way of determining how much you should be spending on each budget category. It says that you should spend 50% of your budget on “needs”, 30% on “wants”, and 20% on “savings”. But remember, just because something is a “need” (like housing) doesn’t mean you can’t find ways to save money. If you live in a downtown apartment and are paying $2,000 a month, you could easily move a little further out of the city center and maybe save $500 per month in a cheaper place. You are still fulfilling the need for housing, but saving money in the process. How much should I be spending in each category? While this will vary with every household, there are some general guidelines. One of them is the 50/30/20 budget above. Dave Ramsey also publishes his recommendations by category and breaks it down a little further. 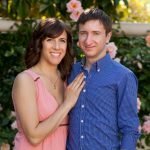 I wrote a whole post about Dave Ramsey’s recommended budget percentages, and compared our own household budget to his guidelines. To my surprise, they actually lined up pretty well! How can I track my expenses automatically? Mint – Created by Intuit (the company behind Quickbooks), Mint allows you to connect all your bank accounts and automatically download your transactions and categorize them. You can then see graphs and charts of your income and expenses by month, and compare to past months. Personal Capital – This is my personal favorite, and right now you can get a $20 Amazon gift card for signing up! It has a lot of the capabilities of Mint, but also adds investment account tracking so you can get a full picture of your net worth and financial position. I use it to keep tabs on my budget as well as my stock portfolio. Click here to sign up for Personal Capital, and get a $20 bonus after linking an account! No matter what tools you decide to use, the important part is to start tracking your expenses into the appropriate budget categories. If you’ve never set up a budget before, I can almost guarantee that you will save hundreds of dollars a month just by starting to track your expenses. There is something about knowing where you money is going that makes you think a little more carefully before making any purchase. Are there any budget categories you use that I forgot? Let me know in the comments below!